Terracycle is one of my favorite eco-friendly companies, because they are the masters at upcycling. From using plastic bottles to sell cleaners and fertilizers to making paper from banana peels and coffee leaves, Terracycle knows how to take green to the mainstream. Their products are sold at major retailers, such as Home Depot, and they are affordable. This Christmas, you can decorate with upcycled goods from Terracycle. 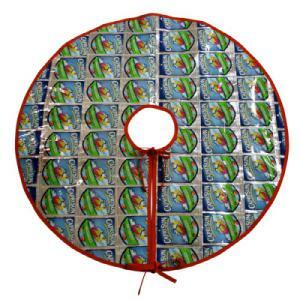 The Eco-Friendly Juice Pouch Tree Skirt is made from sewn together juice pouches. At first glance, you may wonder why you would want such a thing under your tree, but it really does look nice, especially under a live tree. Want a unique and eco-friendly way to decorate for the holidays? This tree skirt is made from recycled juice pouches. Festive coloring adds to the holiday spirit. Terracycle is also making upcycled stockings too! How fun!!!! We bought pencil pouches like this when school started. I started the Terracycle program in my kids schools, but I have to say this is not attractive. I’m all for products made from recycled goods, but I would not go for this. Not knocking the program, just this particular product.